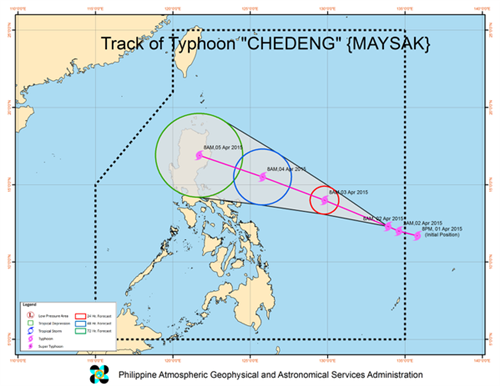 TC Update: as of 03AM today 03 April 2015, Typhoon #ChedengPH was located at 830 km East of Virac Catanduanes (13.8°N, 131.9°E). TC Update: as of 02AM today 03 April 2015, Typhoon #ChedengPH was located at 845 km East of Virac Catanduanes (13.8°N, 132.1°E). 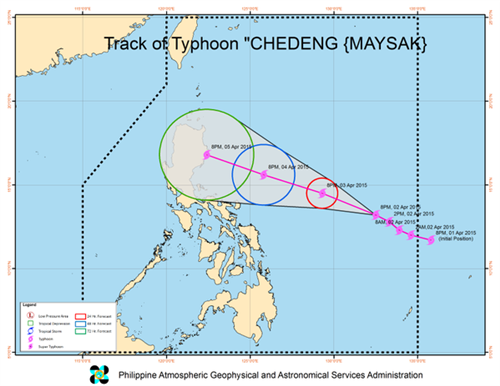 TC Update: as of 01AM today 03 April 2015, Typhoon #ChedengPH was located at 855 km East of Virac Catanduanes (13.7°N, 132.2°E). TC Update: as of 12AM today 03 April 2015, Typhoon #ChedengPH was located at 875 km East of Virac Catanduanes (13.6°N, 132.4°E). TC Update: as of 11PM today 02 April 2015, Typhoon #ChedengPH was located at 885 km East of Virac Catanduanes (13.5°N, 132.4°E). Please po dasal pa more. 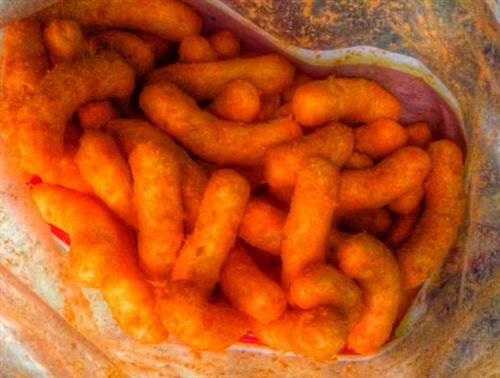 Kayang tunawin ng taimtim na dasal natin ang bagyo. #ChedengPH #ChedengUpdates ???? 2/2 With maximum sustained winds of 175 kph near the center and gustiness of up to 210 kph. It is forecast to move Northwest at 15 kph. TC Update: as of 3PM today 02 April 2015, Typhoon #ChedengPH was located at 975 km ESE of Virac Radar Catanduanes (12.9°N, 133.2°E). As of 2 p.m., Typhoon ‪‎Chedeng was located at 1019 kilometers east of Sorsogon City or 980 km east southeast of Virac Radar Catanduanes (12.8°N, 133.3°E). 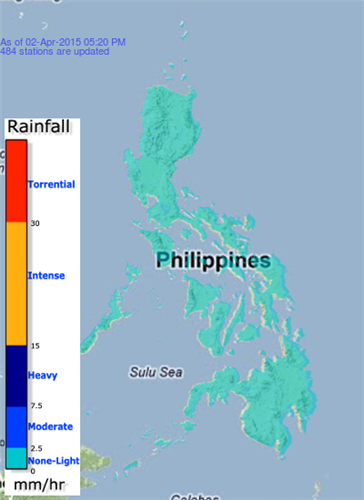 12:57 PM, Light to moderate #rains affecting #Basilan and #ZamboangaCity which may persist for 1-2 hours. "Storm surges and sea surface waves of up to 4 meters are possible over the eastern coast of Samar, Bicol and Aurora-Quezon." No specific areas under storm surge warning as of the moment. 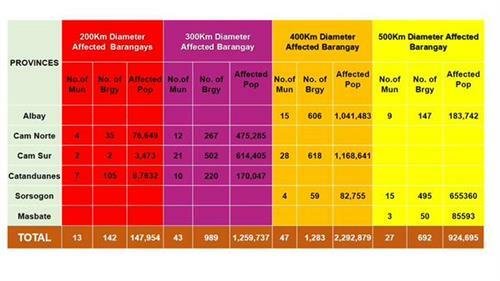 An official warning is expected to be raised by PAGASA later today..